185 Beacon is located on the south side of Beacon, between Berkeley and Clarendon, with 183 Beacon to the east and 187 Beacon to the west. 185 Beacon was designed by Peabody and Stearns, architects, and built ca. 1872 as the home of John Francis Anderson and his wife, Ellen Sears (Amory) Anderson. They previously had lived at 92 Charles Street. John Anderson bought the land for 185 Beacon on November 10, 1870, from James W. Tobey, a builder. It previously had several owners, and originally was part of a parcel purchased from the Commonwealth of Massachusetts on March 7, 1860, by Norman Munson. He and his partner, George Goss, were the contractors responsible for filling the Commonwealth’s Back Bay lands. Click here for an index to the deeds for 185 Beacon. John Anderson had served in the Civil War as an aide-de-camp to General John G. Foster, and at the end of the war was brevetted a Brigadier General. He subsequently became a dry goods merchant in Boston. The Andersons continued to live at 185 Beacon during the 1892-1893 winter season, after which they lived apart. John Anderson moved to Portland, Maine, and Ellen Anderson moved to 455 Marlborough to live with their son-in-law and daughter, Francis Stanley Parker and Harriet Parker. 185 Beacon was not listed in the 1894 Blue Book. On May 2, 1894, 185 Beacon was acquired from John Anderson by attorney Amory Eliot. He and his wife, Mary (Clark) Eliot, made it their home. They previously had lived in Manchester, where they continued to maintain a home. From about 1898, they were joined by Mary Eliot’s parents, Henry Augustus Clark and Lydia Wilkinson (Sumner) Clark, who previously had lived at 103 Beacon. Henry Clark was treasurer of the Eastern Electric Cable Company and formerly was a book and stationery dealer, and manufacturer of “Griswold’s Patent Erasable Tablets.” They continued to live at 185 Beacon in 1900, but by 1902 had moved to The Abbotsford at 186 Commonwealth. 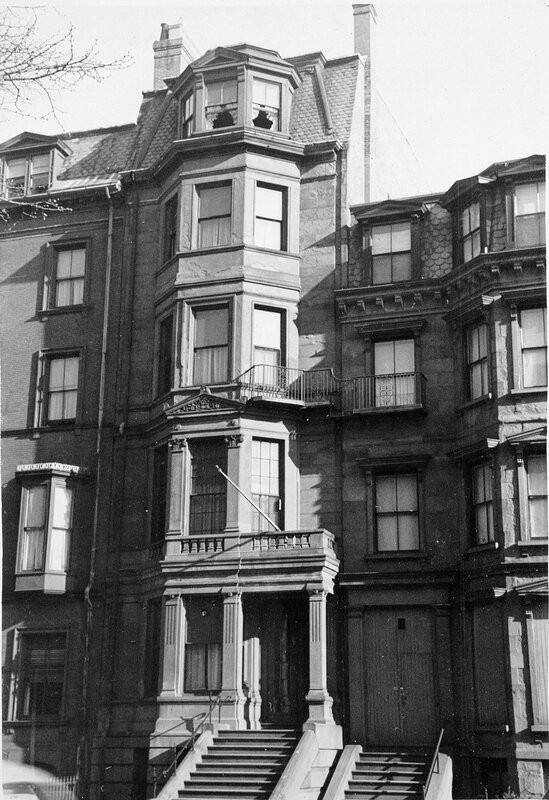 The Eliots continued to live at 185 Beacon during the 1906-1907 winter season, after which made Manchester their home. 185 Beacon was not listed in the 1908 Blue Book. On July 14, 1908, 185 Beacon was purchased from Amory Eliot by Bentley Wirt Warren and his wife, Ellen (Windom) Warren. They previously had lived at 20 Chestnut. They also maintained a home in Williamstown. Bentley Warren was an attorney. From 1925 to 1927, he served as president of the Sentinals of the Republic, an ultra-conservative organization formed to protect states’ rights, oppose government regulation of business, and fight international communism. The Warrens continued to live at 185 Beacon until about 1939. In 1938, they purchased 228 Beacon, which they significantly remodeled and then made their home. On February 15, 1940, 185 Beacon was purchased from Bentley Warren by Roger F. Monet. In March of 1940, he applied for (and subsequently received) permission to convert the house from a single family dwelling into a lodging house. Roger Monet was a linoleum layer and lived at 523 Beacon. In 1940, he married to Cecilia Marie Jarvis. After their marriage they moved to 67 Symphony Road. By 1941, the lodging house at 185 Beacon was operated by Ione E. (Jones) Whitehead Colburn, the widow of Charles Anderson Colburn. She previously had lived in New Hampshire. 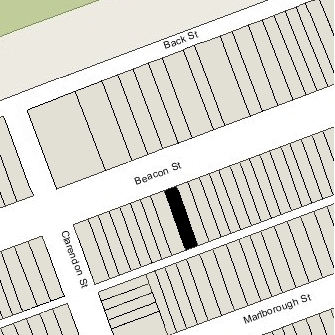 She continued to live there in 1943, but had moved to 179 Marlborough by 1944. On April 27, 1944, 185 Beacon was acquired from Roger Monet by John Dever, a painter and decorator, who operated it as a lodging house. He previously had lived at 217 Beacon, where he operated a lodging house in association with Roger Monet’s father, Adelard Monet. John Dever died in June of 1947, killed when he was struck by an automobile on Beacon Street while walking his dog. On June 9, 1948, 185 Beacon was acquired from the estate of John Dever by Eliot Sanford McMurrough. He was an artist and later would establish an art school in Florida, where he was recognized as the founder of Brevard’s art colony. He lived at 405 Beacon with his mother, Adah Dewitt (Sanford) McMurrough, the widow of John Lawrence McMurrough, who operated it as a lodging house. After he purchased 185 Beacon, they moved and she operated the lodging house there. On March 10, 1950, Eliot McMurrough transferred 185 Beacon to his mother. He married later that year to Eleanor Russell, and they lived at 185 Beacon. Adah McMurrough moved back to 405 Beacon. On October 5, 1951, Adah McMurrough transferred 185 Beacon back to her son. On October 23, 1951, 185 Beacon was purchased from Eliot McMurrough by Edith (Seidle) Wexler, the wife of Dr. Jacob Wexler, who continued to operate it as a lodging house. They lived in Newton. On August 9, 1971, 185 Beacon was purchased from Edith Wexler by Aldo Garda and Robert L. Rusconi, trustees of the Garus Realty Trust. They continued to operate it as a lodging house. On December 12, 1973, they transferred it to themselves as trustees of the Rusgar Realty Trust. On July 15, 1977, 185 Beacon was acquired from Aldo Garda and Robert L. Rusconi by Miss Mary Angela Cocuzzo and Miss Nancy A. Casey. 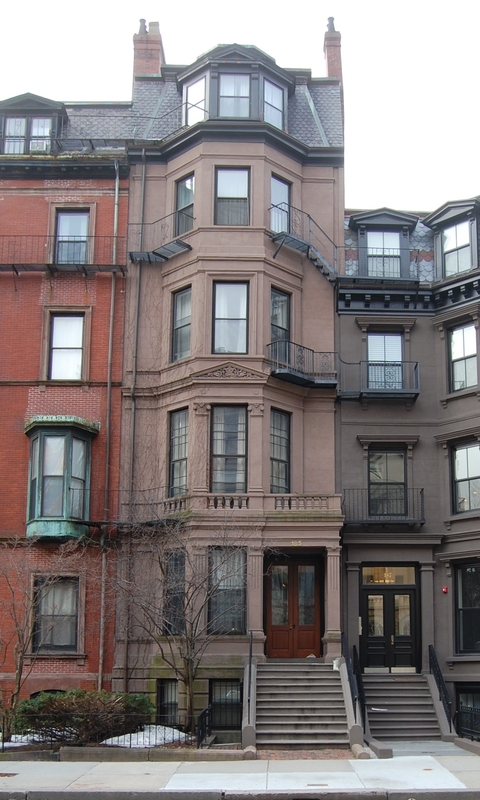 They owned several Back Bay properties which they operated as lodging houses. In October of 1977, they filed for (and subsequently received) permission to convert the house into twelve apartments. In their application, they noted that the property had been “used as such since 1966” (notwithstanding the fact that inspection certificates had been issued as late as September of 1976 to Aldo Garda allowing the property to be used as a lodging house). 185 Beacon subsequently changed hands, and remained an apartment house as of 2015.